If your dental condition is making you feel self-conscious or it is inhibiting you from smiling with pride and confidence, then maybe you would benefit from dental treatments that add to your natural beauty. A radiant smile is easier to achieve now than ever before with advancements in modern dentistry. Tilden Dental Group serves people in Streeterville with cosmetic dentistry that brightens and straightens smiles. Dr. Jordan J. Tilden and Dr. Zachary Tilden take satisfaction in helping patients look and feel their best. One of the first steps many people choose to enhance their smiles is with professional teeth whitening. Brightening teeth to their optimal shade gives you a radiant smile, and it is also an excellent preliminary treatment to other cosmetic procedures. 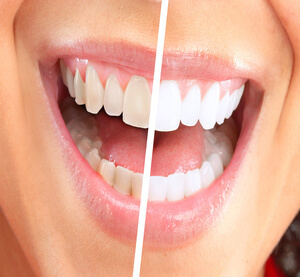 The Tilden Center uses a product called Zoom!® which can lighten teeth by several shades in one dental visit. It is safe for enamel, and many patients complete their routine dental appointments with Zoom! to give them a smile that is healthy and bright. After a protective gingival barrier is placed on gums, Zoom! bleaching gel is applied to teeth. The gel contains hydrogen peroxide and is activated with an LED whitening lamp. The dentist reapplies the gel every 15 minutes for a total treatment time of about an hour. Zoom! is designed to minimize tooth sensitivity, but patients receive a desensitizing gel afterward to treat any temporary discomfort they may feel. Removable for special occasions like weddings, graduations, or anniversaries. Continuation of optimal oral hygiene routines at home and at the dentist’s office. Fewer dental visits that are shorter in duration. Trays can also be used with at home whitening gels to maintain bright smiles. Beginning orthodontic treatment using Invisalign transparent aligners is quick. The dentist will take an accurate impression of your teeth, which is sent to the Invisalign lab where your custom retainers are fabricated. The retainers are received at the second visit. Another remarkable advantage of the Invisalign straightening method is how patients view a 3-dimensional computerized progression of the gradual alignment of their teeth at the first appointment. This gives patients the satisfaction of knowing the outcome of their treatment. Whether looking to brighten or straighten a smile or considering other cosmetic treatments, Dr. Jordan J. Tilden and Dr. Zachary Tilden are capable, compassionate and highly-qualified dentists. Tilden Dental Group provides expert care to people living in and near Streeterville. Call today to learn more about how your natural beauty could be highlighted with Zoom!® or Invisalign® treatments.